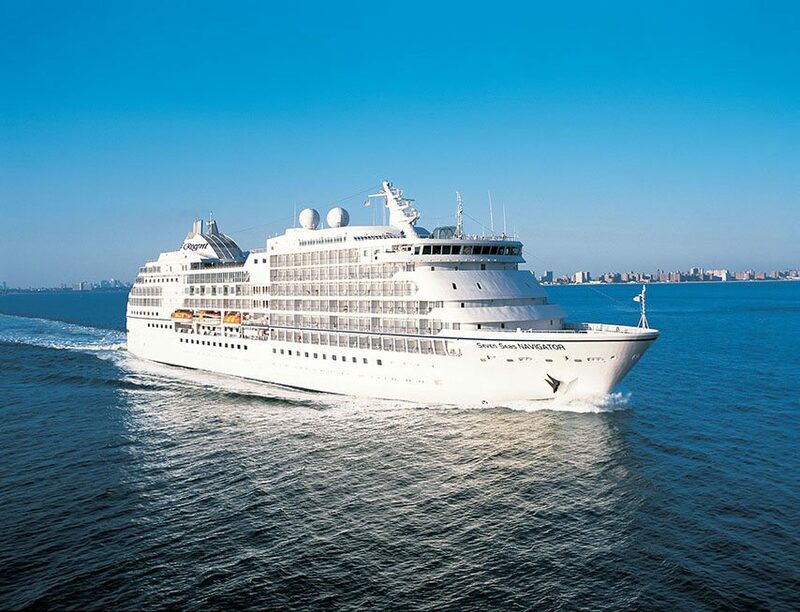 Regent’s Seven Seas Navigator carries just 490 guests. Photo courtesy of Regent Seven Seas Cruises. Seven Seas Navigator carries 490 guests and offers some of the highest space and service ratios at sea. From her all-suite, all-oceanview accommodations with their luxurious marble baths to her signature cuisine to her superbly attentive staff, she has few equals. In 2016, Regent is investing millions of dollars to refit her with an entirely new look and lavish amenities. See below for more information. The downright cozy 490-passenger Seven Seas Navigator is the perfect setting for a luxurious, pampered experience. Freshly upgraded throughout her service career, Seven Seas Navigator boasts the same all-suite design as her two fleetmates, Seven Seas Mariner and Seven Seas Voyager. Cloaked in a warm color scheme of deep earth tones, most of the public rooms are on Decks 6 and 7, just aft of the three-story atrium. The two-story Seven Seas Lounge is for Vegas-style production shows, while the paneled mahogany and cherrywood Navigator Lounge is the place for cocktails or specialty coffees. 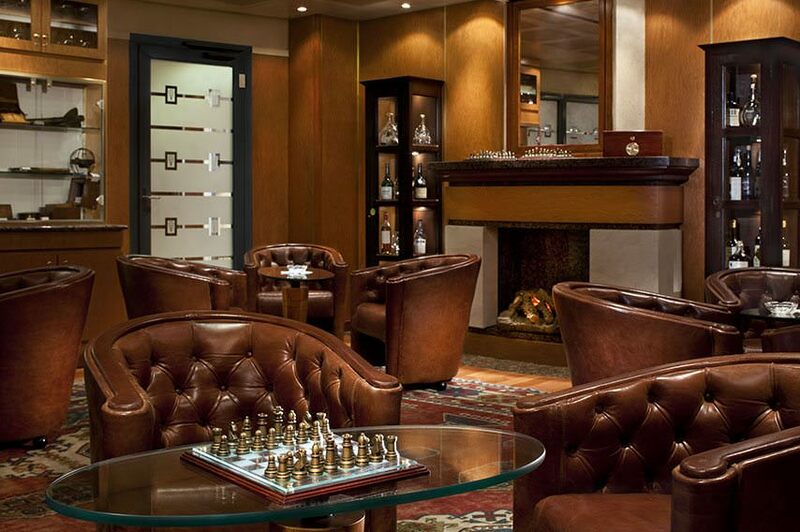 The Connoisseur Club cigar lounge is also wood-paneled and atmospheric, while the Stars Lounge sports a long, curved, black-granite bar and clusters of oversize armchairs around a small dance floor where a live music duo sings pop numbers evenings. 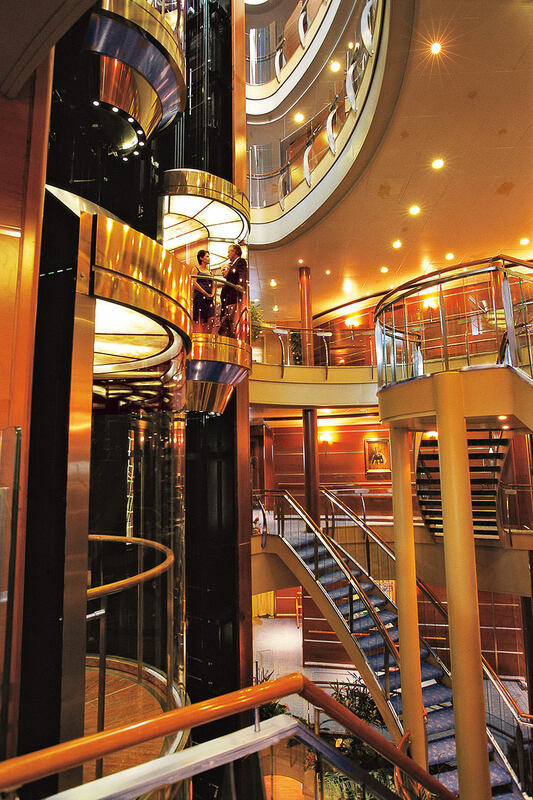 You might not expect it, but Regent’s Seven Seas Navigator boasts a sweeping, multi-story atrium at the heart of the ship. Photo courtesy of Regent Seven Seas Cruises. Wrapped in windows, Galileo’s Lounge features a pianist and on warm nights, the doors to the outside deck are thrown open and dancers spill out from the small dance floor, creating a lovely setting under the stars and inky night sky. A casino is also a part of the entertainment offerings. The well-stocked library has new Dell touch-screen computers with e-mail and Internet access, and there’s also wi-fi fleetwide as well. Want My Help With Your Regent Cruise? Big changes are coming to Seven Seas Navigator in the spring of 2016. Illustration courtesy of Regent Seven Seas Cruises. Big changes are afoot for Seven Seas Navigator. In January 2016, Regent announced it would spend a total of US$125 million over the course of two years to refit its existing fleet. Seven Seas Navigator, the line’s most intimate ship, would be the first to undergo this luxurious upgrade that will take place between March 31 and April 13, 2016 in Marseille, France. When she emerges from drydock, Seven Seas Navigator will essentially be a brand-new ship, creating exciting experiences for both new and past Regent guests alike. No room will be left untouched: Regent plans to refurbish all suite categories, lounges, the library, casino, boutiques, the reception area, and the Compass Rose and La Veranda restaurants. Seven Seas Voyager will undergo a similar refit in late 2016, and Seven Seas Mariner will receive her extensive upgrades in the spring of 2017. Navigator Suite: The spacious Navigator Suite will be updated with a fresh new design, featuring a crisp and elegant look. The bedroom features the new custom-made Elite Slumber Bed, dressed in luxurious 100% cotton sateen bedding. In both the bedroom and living room, an ebony-black wooden vanity with white marble top stretches the length of the room, harmonizing beautifully with the sultry green and yellow accent furniture, draperies and new carpeting. Penthouse, Concierge and Deluxe Suites: The largest collection of suites onboard the ship will receive a luxurious new look. The contemporary design accentuates the spaciousness of the suites. A stunning padded leather headboard supports the Elite Slumber Bed in the bedroom and the sitting area features a plush sofa with a stylish accent table and new artwork. Reception Area: Guests’ first exposure to the renovations will take place in the completely-redesigned reception area, where contemporary and classical design elements seamlessly meet. Marble inlay flooring replete with a compass-like design and polished stone walls with metal inlays guides guests to the dark wooden reception desk. Illuminating the reception area is a gypsum diamond cut lighting fixture embedded in the oval alabaster ceiling, evoking stylish elegance. Compass Rose: The ship’s flagship restaurant will be grander and more resplendent than ever before. Throughout the spacious, 384-seat dining room are subtle geometric patterns underscored by silver leaf, pewter and antique bronze elements. A beautifully ornate silver-leaf feature wall highlights one end of the dining room, while oversized windows run along both sides of the restaurant to provide incredible ocean vistas. Grand crystal chandeliers are enhanced by recessed ceiling lights, providing a dramatic dining experience for guests seated at intimate tables ringed by sleek leather chairs adorned with swirls of celestial blue fabric. La Veranda: Effortlessly chic, La Veranda will feature a fresh and airy design that is accentuated by a wealth of natural light from floor-to-ceiling windows that encircle the restaurant. Guests can enjoy casual indoor and al fresco dining with incredible ocean views, and dine from a delectable buffet for breakfast and lunch. Each evening, the restaurant transforms into an elegant fine dining restaurant, Sette Mari La Veranda, for dinner. Galileo Lounge: True to its name, the Galileo Lounge on Deck 11 conveys a celestial feel, beginning with its tempered glass double-door entrance trimmed with an abstract design reminiscent of the solar system and featuring a decorative sun-shaped handle. That theme extends inside the 132-seat cocktail lounge, where a night-black oval-shaped ceiling twinkling with fiber-optic “stars” overlooks the inlaid wooden dance floor. Guests can be immersed in the action, or retreat to high-backed wing chairs that line the room’s windows. Navigator Lounge / Coffee Connection: By day, these intimate Deck 6 venues – connected by a central walkway – are bathed in natural light from a bank of windows overlooking the sea. The new design and furnishings enhance that airy look, with cream-colored fabrics on chairs and draperies, and white marble topped tables with hammered copper accents. By night, the Navigator Lounge transforms into a small night club, with a Steinway piano as the centerpiece. Adding to the elegance are leather-wrapped columns with a copper-topped capital and dark wooden base. Library: The bright yet intimate library exudes comfort and charm. From its faux fireplace to cream-colored sofas resting atop a glistening marble floor, the room is reminiscent of a library found in a residential estate home. Ringing the room are dark wood book shelves encased in glass, while a glistening, copper-adorned chandelier serves as the room’s glistening centerpiece. It’s the ideal spot for reading and quiet reflection. After dinner, why not stop off for a relaxing nightcap? Photo courtesy of Regent Seven Seas Cruises. When it comes to cuisine, take your pick from three restaurants: the elegant open-seating main dining, a casual venue and the new Prime 7 steakhouse. There’s also a barbecue grill near the pool for burgers, paninis, fries and similar fare. For exercise, visit the newly revamped fitness center, pool, two hot tubs and a pair of golf nets. If the spa is more your speed, it’s run by Canyon Ranch and offers a long list of rejuvenating experiences. Deluxe Veranda Suites aboard Regent’s Seven Seas Navigator clock in at 356 square feet. Photo courtesy of Regent Seven Seas Cruises. 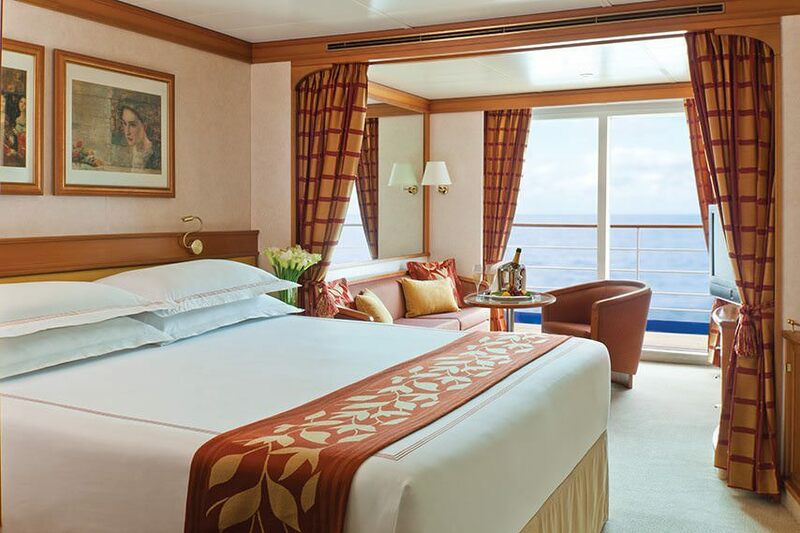 When it’s time to wind down, it’s sheer pleasure retiring to one of the ship’s attractive suites. A full 90% of them have private balconies, and even the smallest suite onboard still breaks the 300 square foot mark. It is worth noting, however, that a few outside cabins on the port side of Deck 6 have obstructed views. The leaders of the pack, Seven Seas Voyager’s largest suites measure more than 1,000 square feet and feature sprawling balconies, while guests staying in Suite Category C and above are pampered with butler service and unlimited bottles of champagne. Every suite on the ship has a marble bathroom with a separate shower and a long tub, plus a sitting area with a couch, a pair of chairs, flatscreen TV with DVD player (and movies available from an onboard library), terry robe, minibar stocked with two complimentary bottles of wine or spirits. To celebrate our anniversary ,my wife and I decided to splurge on an Alaskan cruise with the Regent cruise line. As the time for departure approached and we still had not received the information about the land package,we had to call Regent. They discovered that they had forgotten ! to book the package and the hotel stay , and promised to get on it and will call us back ” the next day”. They did not. We had to call them several times. Their excuse was that they were allowed to communicate with their hotel department in Florida only via e- mail ! and had not gotten a response yet. Finally several days and phone calls later! we were assured that everything was taken care of. To be on the safe side , we sent them a short and sweet e- mail asking them to confirm this in writing. Then all hell broke loose . We got very quickly a phone call from a Ms P.H. Everything about her long tirade was haughty ,condescending , and sarcastic : why would we doubt Regent ? ; have we not read page 5 ,paragraph 4? ( we had); didn’t we see the land package info ? ( we had not as they forgot to include it );and on and on. Mercifully the tirade ended but only after my wife offered to take a picture of that page and send it to her as a proof we are not lonely people calling to chit-chat, or the proverbial customers from hell with time on our hands. Forward 3 days later , and we landed at the Anchorage airport.We proceeded to the Marriott only to discover that we had no on-site greeter, no welcome letter for information or instructions and no luggage ! Apparently since Regent was so late trying to book us a hotel, they were forced to put us at the Marriott while the rest of their clients were all lodged at the Hilton. They simply forgot to inform their tour operator ! So we had to go to the Hilton to retrieve our luggage.Apologies were given and accepted and we returned to the Marriott. We thought our problems were finally over,until the next morning when we went for breakfast only to discover that our breakfast voucher was for one person only! Now finally the great news : the cruise itself was a dream! The ship was extremely clean, well-maintained and well- organized.The accommodations were superb ( get a balcony if you can afford it ). The entire ship crew was extremely friendly and professional. The food was outstanding. Everything was above reproach.A simply amazing and delightful experience.Nothing short of spectacular ! 1) Please stop sending me ads and e-mails about your various upcoming cruises : my wonderful experience on the Navigator has not yet completely erased the bad taste in my mouth from the distasteful repulsive attitude of most of your phone representatives at headquarters . 2) Think of assigning few of your delightful ship crew personnel to headquarters : they have a thing or two to teach some of your customer service personnel about friendliness , respect and professionalism.